I have used 4 patches so far. The first was on my lower back just above sacrum. Second was right below my knee. Third and fourth were on my right and left flanks. Attached is a picture of the rash I got on all applications except the one below the knee. It is a burning and itching sensation and I have been taking benadadryl capsules to counter it. I am allergic to latex ( the box from Archway indicates that patches are latex free) and also from IV contrast used in cat scans. The picture is from the last application 4 days ago and was much redder on second and third day. Nad was on top of picture, saline on bottom. I spoke to Archway and was told that some parts of body may be more sensitive and it was ok to just use balance of patches just under knee. I asked if the patch is applied on a bony area whether that would affect effectiveness. They said as long as patch is on the skin NAD+ will be absorbed. Sorry to hear that. The principle of how it works is the ionic NAD solution gets pulled in via the sweat glands and hair follicles. Looking at the rash markers above we can clearly see an outline of the + terminal pad above and the negative below. Interestingly it looks like the rubber lip of the pad (to contain the fluid) also left a mark. It appears then like it's not the bandage adhesive but the electrophoresis which is causing the trouble. Unfortunately not much you can do I think. 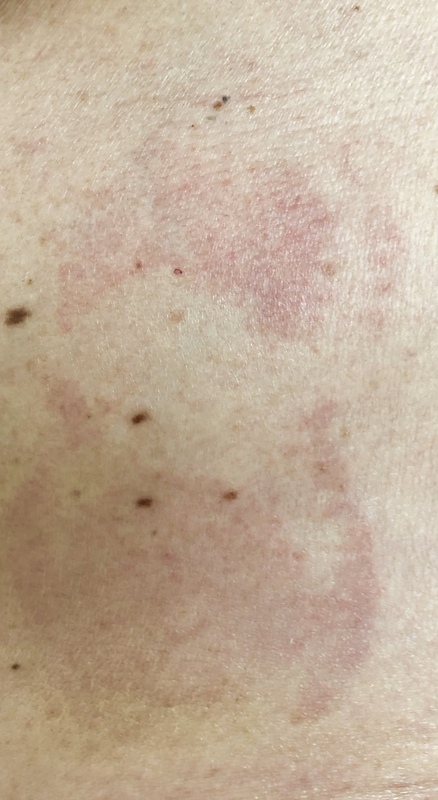 I've done five in succession with only a few minor small red spots, for you it looks like you're having a reaction to the NAD intrusion into your skin. For some people maybe an IV is the best option. FWIW my wife appeared to have a reaction to 500mg of NAD supplementation after two weeks. Difficulty standing/keeping her balance and other strange issues that disappeared. She took a break and now is back on 250mg and is doing fine. Maybe some people are more sensitive to NR. what timing are you using for dosing? Pharmacy advised any from 1 day to one week. What are the thoughts on what is best? BobM Frequency you mean? No more than 1/day, I did them on consecutive days. Don't see any reason to spread it out. Bill's recommendation is to do a box of patches, then test to see if that was sufficient. AFAIK the idea is to raise blood levels, so if you can handle the patch without adverse reactions it seems to me that just doing it consecutively is as good as any. Follow up with 250-500mg oral daily to maintain levels. In early 2019 there should be a test available to check your NAD blood levels. BobM I just reminded myself of the IV approach. AFAIK it's 3 days not consecutively (like M-W-F). This may be for convenance (you have to sit at a clinic for hours) or because being just 3 is obviously higher per dose. Regardless with that data point I'd say that yes doing the patches in a week time period is a good approach, if you don't have any issues. With the IV's apparently people can have a reaction, flushing, racing heart beat and such. I'd suggest monitoring your blood pressure while patching and also get a spirometer for good measure (I use the iHealth Air which feeds Apple Health database, and the Qardio BP cuff which does the same). When you do an IV they monitor BP to make sure you're reacting OK (I haven't heard of anybody doing poorly, but CYA). I like the Blood Pressure Monitor idea. It’s easy. great suggestion! I think I will do 2-3 day intervals. That will be 1/2 a month. Then I will do a full blood panel to see if anything has changed from last month. Bernie I take it back, looking closer at my application from yesterday indeed I do see a ring from the lip portion and a bit of redness inside. So yes I'm also having a reaction, if milder. Did you use the 4 or the 8 hour? I got the 8, didn’t know which but had to pick one. Maybe the 8 is more low key and slower. DanMcL I used the 8 hour and left on for 12 hours.